Well, the truth is that flavored vinegars can be used in ANY recipe that calls for regular vinegar. They just add another layer of flavor. If you do nothing else with a flavored vinegar, try making a vinaigrette with one. It’s fabulous. Here is a classic recipe for you to try. I especially like to use the fruit vinegars for this purpose. What kind of vinegar should you use? You need a vinegar as your base for steeping your flavorings. The most important thing is to pick a vinegar that is at least 5% acidity. Be sure to check the label. That pH level will assure that your vinegar will preserve your flavors well and be safe to store at room temperature. To assure the proper acidity, I do not recommend using a homemade vinegar. Instead, pick a store-bought variety. I do NOT recommend using white distilled vinegar. It’s flavor is too sour and strong and that overpowers the flavors you are trying to bring out. All you need is a wide-mouthed glass jar or container. And that jar can be any size from quart to gallon. And I am not talking about just canning jars here. ANY glass container will work. Just don’t use plastic. The reason that the exact size is not important is because I have a basic formula for making flavored vinegar that is based on the size of the jar. Fill your jar up to one third to one half way the jar with whatever your flavorings you’ve chosen. In other words, take your fruit and the herbs and the spices and fill your jar, no matter the size, so the flavorings fill up one-third to one half the jar. In the case of herbs, you would fill the jar with the fresh herbs but don’t pack them down. Then you are going to be filling the rest of the jar with hot vinegar. I’ve found this ratio yields a really strong flavor in a short amount of time. When making vinegars, it is important to only use stainless steel or enamel pans. Aluminum pans or utensils will react with the vinegar. Wooden or plastic spoons are fine. Wash all your jars in hot, soapy water and dry the inside. It is important to thoroughly dry the inside as if you leave water in the jar it will cloud your vinegar. And you want a crystal clear vinegar when you’re all finished. Wash and pat dry whatever you are using as flavoring: fresh herbs and/or fruit. You don’t need to rinse your spices. Before you fill you jar with your flavorings, use it to measure out about 3/4 of a jar of vinegar and pour that into a stainless steel or enamel pot for heating. That way you can be assured you have the right amount of vinegar. Fill the jar one-third to one half way full of your flavorings. If you are putting in fruit and it’s something large like peaches, cut it up into quarters. Smaller additives like raspberries or blueberries can be placed in whole. Heat your vinegar until just before boiling. Carefully pour the vinegar into your jars leaving a head space of an inch or so. (You just need space for stirring so that you don’t slop over. If using fruit, make sure it is submerged. If not, use a weight like a ceramic plate to keep it from sitting above the vinegar line. Shake or stir your vinegar everyday. After about 3-5 weeks your vinegar will be ready. You can test it by dipping in a stainless steel spoon and tasting. Because the fruit will disintegrate while it’s in the jar you will want to strain fruit vinegars through a sieve to get the big pieces out. Then I strain it again through cheesecloth or tea towel. This will ensure you get a crystal clear vinegar. If you want to go the extra mile, do a final straining through a coffee filter. That’s it, you’re done! Pour the flavored vinegar into clean decorative bottles and cap with a cork or bottle top that comes with the bottle. Alternatively, you may use any jar or re-purposed jar you have for storing. Your finished vinegar may be stored in your pantry for about a year. After that, its quality goes down and it will be time to make a new batch. Have you ever made infused vinegars? How do you use them? 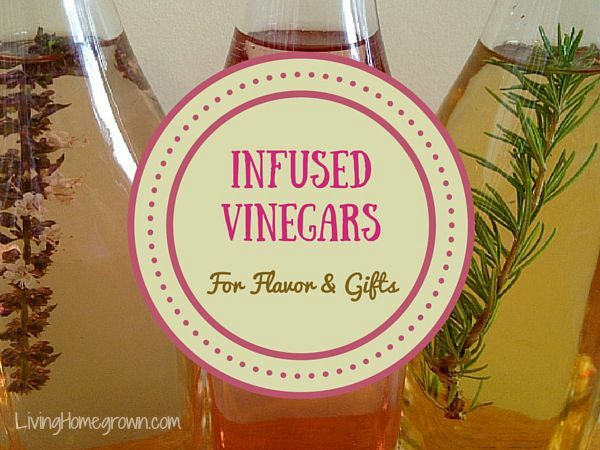 I have never used flavored vinegar, but now I can’t wait to make some.! Thanks so much for sharing. Off subject but similar. I made a satsuma plum sauce with bourbon and it’s really good. Satsuma plums, sugar, lemon juice, soy sauce, fish sauce, trace ghost pepper, black pepper, star anise and bourbon. That sounds awesome Richard. Wow. I received a bottle of herb-infused vinegar about 20 years ago and loved it. I got the instructions (exactly as written here) and try to make some every year to have a supply on hand. The herbs are garlic, sage, rosemary and thyme. I’ve always used rice vinegar but I’m going to try white wine vinegar this time. It makes vinaigrette taste so much better! Thank you for posting this! It does make vinaigrette so much better. That sounds like a lovely combo Stephanie. Hi Theresa, Your basic vinaigrette recipe is missing mustard in the ingredient list. Same amount as the vinegar? I made a few different infused vinegar last year and gave as gifts to family and friends, I have already been asked to refill the bottles this year!